The Analytical Writing Assessment (AWA) section, consisting of one 30-minute essay, measures the test taker's ability to formulate an appropriate and constructive critique of a specific conclusion based on a specific line of thinking. 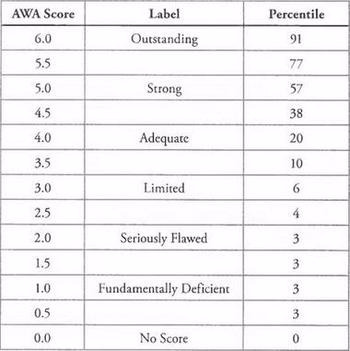 The AWA score is an average of the two independent ratings. 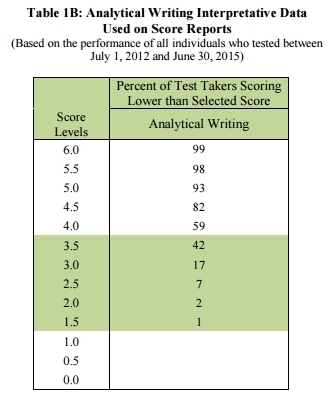 Scores average from zero to six, in half-point intervals for each task.Writing scores are computed separately from the scores for the multiple-choice sections of the test and have no effect on the Verbal, Quantitative, or Total scores. Actually, this is a clear and concise description of the very first section of the test. Unfortunately, the AWA is the most pretermit section on the GRE. Test takers across the world believe that mastering the AWA is an easy task to accomplish in just few days of study. If you are looking to score a perfect 6.0 on the AWA section, you will have to be a lot more planned than most other students. Just as with the Verbal and Quant sections, scoring well the AWA part of the testy requires the same amount of confidence, persistence, and practice. 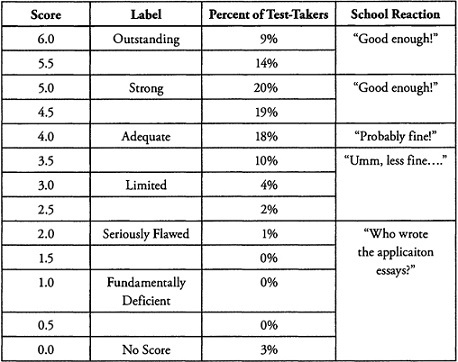 Therefore, you’ll examine a flawed argument and the scoring system is designed in a way that your responses to each of these essay questions are scored on a 6-point scale, with 6 being the highest score and 1, the lowest. This is how looks like the average score of the students during this section related the overall percentile at the end of the exam. As you can suddenly spot from the chart above your goal is to be in the 19% range at the very least. The reason is pretty straight: the only way for a BS to measure your skills and to grasp a graduate-level academic coursework conducted in English, particularly if you are a non-native speaker is the AWA. Moreover, the situation becomes complicated if the AWA score is terrible and the same student produces an outstanding well-written essay, letter of intent or else to impress the committee. This can be a potential red flag that someone has cheated on the application. This means literally that your essay must be clear, who grades your essay should understand it right away. They will have the time neither to scrutinize your sentences in order to grasp the meaning nor to check your spelling if not in the minimum part. Remember: the graders have only two minutes on average per essay; therefore, spending more time on that will be certainly detrimental in their job. So, make sure you have solid points and clear logical reasoning that can be easily understood. The architecture of your essay must be fluent, easy, even passionate in its unfolding. In a hypothetical way, it should put a smile or a wow on the mouth of who reads the same from the head down. This way, every paragraph reads like a separate story, and the essay graders can easily scan through your entire response effortlessly. The transitions are smooth, and there aren’t any sudden twists in your response, it will make the grader’s job a whole lot easier. One sure method of making an essay dull, lifeless and monotonous is to have all its sentences of the same length. To sound smart, you should consciously try to vary the lengths of your sentences. While some of your sentences may bee fairly long with three or four subordinate clauses, others must be short with just five or six words. The changing rhythm of your writing will give your prose a snappy, intelligent tone, and will keep the reader alert and interested. Instead of all sentences as narrative ones, you should also try to introduce, in appropriate places of your essay, an interrogative (which is in the nature of a question) and an exclamatory sentence. As most in life, a balance is advisable. Your writing does not have the necessity to be complex such as Hemingway was writing, with an obscure jargon or a twisted vocabulary; on the other hand, the essay should be neither from an elementary level nor heavy vocabulary driven. The AWA is not testing how much vocab you have in your arsenal. Of course, if the prompt talks about a feasible plan from a company to increase the market share you are not going to write about how to plant crops. I.E. As long as you use sensible reasoning, proper grammar and as long as you can defend your point intelligently and use precise vocabulary to convey meaning effectively, you should be alright. Although negligible errors throughout the passage will not interfere with your evaluator for grasping the real sense of the essay, silly mistakes do. As soon as they will spot them. as a consequence will be more on the look out for aftward errors or even intricate sentences that bring in confusedness and distort the fluency and the cogency of the AWA. Take time to proofread your essay, once you finish writing it. This bullet is more related to the intimacy, to the core quality of the AWA. Reasoning in its way is more attached to the sense or purpose of your writing, and less to the aesthetics. It shows your clear idea in its unfolding, how to explain your thoughts to counteract and as it turns out to nail the flaw, that is the central task you are trying to tackle. Reasoning is all about "what am I saying?? how am I conveying my ideas about ??. You must corroborate your writing. You will ideally want to provide convincing evidence to back up your thesis. Search for cues, either direct or implied, and connect them with the essay. If you are a long-essay fan and insist to pen a high scoring AWA essay, you should write anywhere between 500-600 words. One of the ways to sound smart while writing an essay is the appropriate use of what are known as ‘signpost’ words or phrases. Some of the ‘signpost’ words and phrases are: For instance: for example, however, on the other hand, although, unlike, yet, nevertheless, since and therefore. Signpost words and phrases are valuable in many ways. They help the reader to follow your argument more easily. They make the purpose of every detail, fact, story or example which you use more obvious. More important, they make your essay sound well-organized. By emphasizing the structure of your argument, the signpost words prove that you have thought through the argument rather than rambling aimlessly from one idea to another and that you have got a plan and you are following it intelligently. 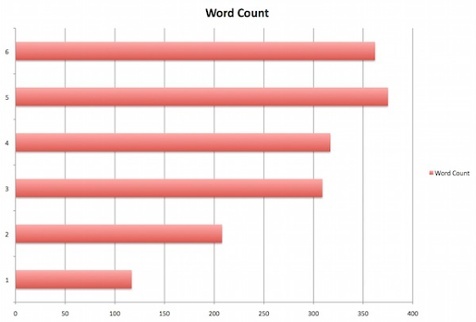 There is a significant increase in the number of words from a 5.0 graded essay and a 6.0 graded essay. Moreover, there is a close connection between essay length and the final score. Longer essays usually score better on every essay topic. Here are probably my favorite websites and two among the best on the internet. Of course, you do not have the impellent necessity to memorize all these stuff. However, one of the key tool to crack the AWA, adding variety and consistency to your task, is proper the knowledge of these. They add to your essay: consistency, avoid boringness, give a clear sign that you are mastering the language. GMATAwa.com This is an amazing online tool. The grading happens instantaneously, and as soon as you submit your essay, you will receive a composite AWA score, along with various metrics on which your essay has been graded. Self-Evaluation - this is probably the less indicated way to evaluate your essay simply because, even whether is true that you can fix errors such as spelling, punctuation and so forth, is really difficult to spot whether your essay is consistent and rock solid. Forums or other internet outcasts. Before to dive into the process that is at the core of your mission, let's take a look how we can refine the course of action behind a 6.0 score in your essay. An essay analyzing an ‘Argument’ is easier to compose than one analyzing an ‘Issue’. This is because, in the case of an ‘Argument’, you have some concrete statements in front of you to investigate, and do not have to start from scratch. 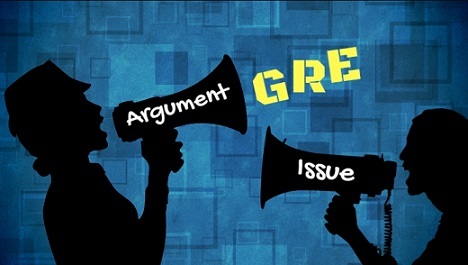 An ‘argument’ passage will consist of some facts, some research findings or some opinions of experts followed by some conclusions or recommendations by the author of the argument. You must recognize each of these and must differentiate among them. You should write a critique of only the last, namely the ‘conclusions or recommendations’. You should not try to question the correctness or the accuracy of the first three. As we mentioned earlier, the students must estimate-evaluate-figure out what is the core of the essay: a flaw in the resoning. Some experts identifies 24 common flaws made by everyone; others "only" 14. Of course, for the GRE AWA section, you certainly needs to spot the flaws in the argument but solely some of these are really relevant for your purpose. 1. Questionable cause - Sometimes called confusing causation with correlation, this is one of the most committed flaws. Cause-and-effect is generally extremely hard to prove whether you are talking about a business plan, a historical event, or a chemical reaction in the body. In this scenario, the cause is wrongly identified. Most likely, these events are correlated, not causal. 2. Double meaning - This unearth especially in numebr of times people at not really "in there" in the issue or don’t want to take the time to explain themselves. On the test, you will find all kinds of phrase and words that lack a clear meaning. This is a flaw you should point out. Acyaully, ambiguity is something (word, phrase, intent) that you mismatch. 3. Composition/Division – By another name, this is stereotyping. If you assume that a characteristic of a member of a group is representative of all members (or vice versa), you are committing this flaw. Don’t stereotype individuals or groups based on your narrow experience, and don’t let other people get away with it either. 4. Black-or-White – Sometimes called a binary argument, or assuming that two courses of action are mutually exclusive, this flaw happens often. Humans have to simplify the world in their mind in order to make sense of it. Another metaphor of this is that all is in or out. More often than not, thete is a grey zone in between we should take in account to get better insights. 5. Anecdotal – Just because you had a bad dinner in a restaurant doesn’t mean that you should think that it is a bad place. In reality, it is probably really nice. Don’t let your narrow experience of something, or someone else’s, influence your opinions or conclusions, so don’t let them get away with it on the test. 6. The Texas Sharpshooter – Humans will unconsciously ignore information that contradicts their beliefs while actively seek out information that confirms their beliefs. A sort of mental cherry picking that allows us to feel comfortable with our decisions and beliefs. But, this is flawed. No using partial information or data to support conclusions. The Analysis of an Argument is specifically made to test your ability, skills, way of thinking to appraise or gauge someone else’s argument. As you ca notice, it is a circular unfolding that you must do not always in a sequence way, from the head down, but most often than not in an overlapping manner. It is true that you go from point 1 to 5 in a straight way. Nonetheless, this kind of task almost never should be treated in such way. A flexible, holistic approach is advisable. I.E. you should refer in the circular way to attack the essay, as aforementioned in the figure above. How, in concrete_schematically, your essay appears when you jot down it. The following template gives a clear_cut idea which is which. Until now, everything is fine. What we outlined seems easy and beautiful to you. wow. but in concrete ?? how can I dissect the argument in a precise way ?? Ok. Here we are to do just what is going to be the essential part of the entire guide, we read now. In surveys Mason City residents rank water sports (swimming, boating and fishing) among their favorite recreational activities. The Mason River flowing through the city is rarely used for these pursuits, however, and the city park department devotes little of its budget to maintaining riverside recreational facilities. For years there have been complaints from residents about the quality of the river's water and the river's smell. In response, the state has recently announced plans to clean up Mason River. Use of the river for water sports is therefore sure to increase. The city government should for that reason devote more money in this year's budget to riverside recreational facilities. Write a response in which you examine the stated and/or unstated assumptions of the argument. Be sure to explain how the argument depends on the assumptions and what the implications are if the assumptions prove unwarranted. The very first step is to evaluate and brainstorm the argument in front of you. There is not a clear difference between the two stages. You evaluate the argument AND at the same time think what you are going to undermine. As you read, identify the conclusion— the big claim that the author is making. The rest of the argu­ment typically consists of background information and premises— facts and smaller claims made to support the conclusion. This support will always be flawed. Cut the chase, you should keep in mind first and foremost the fallacies mentioned earlier in this guide and at the same time try to generate ideas for jotting down your essay. 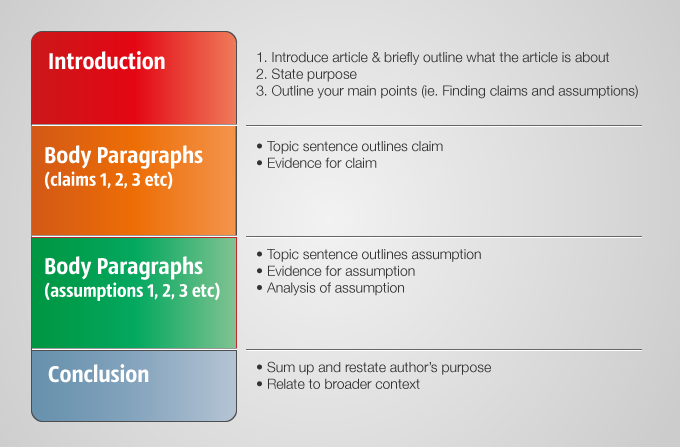 Remember the holistic approach: I think what's going on, try to generate ideas, what is the real conclusion of the argument, what is saying to me, that I need 3 paragraphs and a conclusion and that at the very beginning I need an introduction, restating the claim of the essay. Restatement_Intro of the image above. Notice how the first word of the prompt is a survey.This already is a clearly sign to spot the gap in the argument. A survey is always disputable. While it may be true that the Mason City government ought to devote more money to riverside recreational facilities, this author's argument does not make a cogent case for increased resources based on river use. It is easy to understand why city residents would want a cleaner river, but this argument is rife with holes and assumptions, and thus, not strong enough to lead to increased funding. 1st para of the image above. Suddenly the student identifies the hole in the argument and poses a clear example of attacking immediately the fallacy in the assumption. Citing surveys of city residents, the author reports city resident's love of water sports. It is not clear, however, the scope and validity of that survey. For example, the survey could have asked residents if they prefer using the river for water sports or would like to see a hydroelectric dam built, which may have swayed residents toward river sports. The sample may not have been representative of city residents, asking only those residents who live upon the river. The survey may have been 10 pages long, with 2 questions dedicated to river sports. We just do not know. Unless the survey is fully representative, valid, and reliable, it can not be used to effectively back the author's argument. 2nd para of the image above. Using additionally the student reinforces his/her argument, even more weakening the assumption behind the survey. Additionally, the author implies that residents do not use the river for swimming, boating, and fishing, despite their professed interest, because the water is polluted and smelly. While a polluted, smelly river would likely cut down on river sports, a concrete connection between the resident's lack of river use and the river's current state is not effectively made. Though there have been complaints, we do not know if there have been numerous complaints from a wide range of people, or perhaps from one or two individuals who made numerous complaints. To strengthen his/her argument, the author would benefit from implementing a normed survey asking a wide range of residents why they do not currently use the river. Building upon the implication that residents do not use the river due to the quality of the river's water and the smell, the author suggests that a river clean up will result in increased river usage. If the river's water quality and smell result from problems which can be cleaned, this may be true. For example, if the decreased water quality and aroma is caused by pollution by factories along the river, this conceivably could be remedied. But if the quality and aroma result from the natural mineral deposits in the water or surrounding rock, this may not be true. There are some bodies of water which emit a strong smell of sulfur due to the geography of the area. This is not something likely to be affected by a clean-up. Consequently, a river clean up may have no impact on river usage. Regardless of whether the river's quality is able to be improved or not, the author does not effectively show a connection between water quality and river usage. Conclusion of the image above. Conclusion. Our thoughts about. Restatement of the wrong assumptions made by the city gov. A clean, beautiful, safe river often adds to a city's property values, leads to increased tourism and revenue from those who come to take advantage of the river, and a better overall quality of life for residents. For these reasons, the city government may decide to invest in improving riverside recreational facilities. However, this author's argument is not likely significantly persuade the city government to allocate increased funding. convincing because it is based on a few unproven assumptions. For all these reasons, the argument is not completely sound. Restate the given argument and say that it has two/three/four flaws. Point out the second flaw, and show it could be plugged only if another specific assumption (which is missing) is made). Point out the third flaw, and show it could be plugged only if another specific assumption (which is missing) is made). Summarize your essay with the statement that, because these assumptions have not been stated, the given argument is weak. What this means is you should properly analyze the given issue and take a strong position: either negative or positive, and then interpret examples as to why you have chosen that particular side. Discuss the extent to which you agree or disagree with the statement and explain your reasoning for the position you take. In developing and supporting your position, you should consider ways in which the statement might or might not hold true and explain how these considerations shape your position. You can also take a middle position or other approaches could involve taking a historical, philosophical or sociological stance or, with equal effectiveness, using personal experience to illustrate a position. Introduction: Actually, this is the introduction and the hypothesis that you put on the table to weaken the argument. Notice the assumption on which the entire statement relies. Instead, in the very first part of this introduction, the student gives a context, which is very important. The statement linking technology negatively with free thinking plays in recent human experience over the past century. Surely there has been no time in history where the lived lives of people have changed more dramatically. A quick reflection on a typical day reveals how technology has revolutionized the world. Most people commute to work in an automobile that runs on an internal combustion engine. During the workday, chances are high that the employee will interact with a computer that processes information on silicon bridges that are .09 microns wide. Upon leaving home, family members will be reached through wireless networks that utilize satellites orbiting the earth. Each of these common occurrences could have been inconceivable at the turn of the 19th century. The statement attempts to bridge these dramatic changes to a reduction in the ability for humans to think for themselves. The assumption is that an increased reliance on technology negates the need for people to think creatively to solve previous quandaries. Looking back at the introduction, one could argue that without a car, computer, or mobile phone, the hypothetical worker would need to find alternate methods of transport, information processing, and communication. Technology short circuits this thinking by making the problems obsolete. 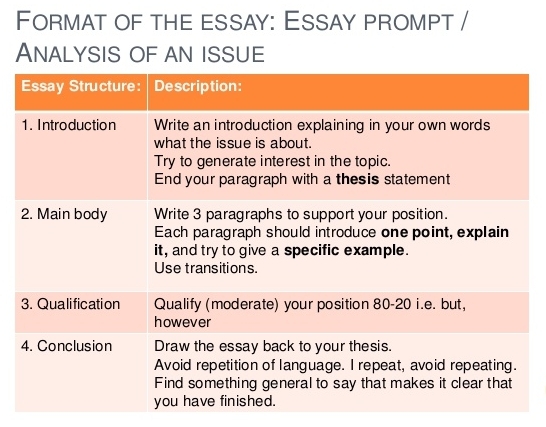 2nd para of the template above - Main body of the essay. The student use the word-shift however, starting to weaken the argument.Following a clear and cut-off example. Moreover, he/she reinforces his/her/thesis with the consequences of this position. However, this reliance on technology does not necessarily preclude the creativity that marks the human species. The prior examples reveal that technology allows for convenience. The car, computer, and phone all release additional time for people to live more efficiently. This efficiency does not preclude the need for humans to think for themselves. In fact, technology frees humanity to not only tackle new problems, but may itself create new issues that did not exist without technology. For example, the proliferation of automobiles has introduced a need for fuel conservation on a global scale. With increasing energy demands from emerging markets, global warming becomes a concern inconceivable to the horse-and-buggy generation. Likewise, dependence on oil has created nation-states that are not dependent on taxation, allowing ruling parties to oppress minority groups such as women. Solutions to these complex problems require the unfettered imaginations of maverick scientists and politicians. In contrast to the statement, we can even see how technology frees the human imagination. Consider how the digital revolution and the advent of the internet has allowed for an unprecedented exchange of ideas. WebMD, a popular internet portal for medical information, permits patients to self research symptoms for a more informed doctor visit. This exercise opens pathways of thinking that were previously closed off to the medical layman. With increased interdisciplinary interactions, inspiration can arrive from the most surprising corners. Jeffrey Sachs, one of the architects of the UN Millenium Development Goals, based his ideas on emergency care triage techniques. The unlikely marriage of economics and medicine has healed tense, hyperinflation environments from South America to Eastern Europe. This last example provides the most hope in how technology actually provides hope to the future of humanity. By increasing our reliance on technology, impossible goals can now be achieved. Consider how the late 20th century witnessed the complete elimination of smallpox. This disease had ravaged the human race since prehistorical days, and yet with the technology of vaccines, free thinking humans dared to imagine a world free of smallpox. Using technology, battle plans were drawn out, and smallpox was systematically targeted and eradicated. ConclusionThis is the conclusion of the template above.The student gives his/her consideration about, in brief. Technology will always mark the human experience, from the discovery of fire to the implementation of nanotechnology. Given the history of the human race, there will be no limit to the number of problems, both new and old, for us to tackle. There is no need to retreat to a Luddite attitude to new things, but rather embrace a hopeful posture to the possibilities that technology provides for new avenues of human imagination. How to score well on AWA? kindly can some one tell me; since my uni require 300 marks from Q and V section combine, also english isnt my first language i was thinking can i omit this section during test? would that affect my overall score? AWA is a separate section that is scored out of 6. If you omit it you score a 0 in this section. I do not know if that has an impact on your admission chances(as you say your program needs only verbal and Quant sections scores), generally speaking its a bad idea to omit this section. I have edited the main post, fixing the second possible template for the Issue Essay. In this latter, you can agree or disagree with the argument proposed to you and from here move further giving your reasoning. does the number in the template referring to paragraph that we should make? Can we just make 1 paragraph that moderate our position? without refute every argument on each paragraph? 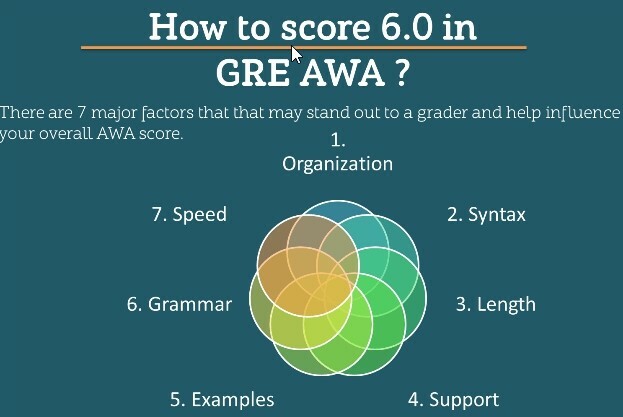 Please, to have a better and clear idea how to write and structure the AWA for the GRE exam follow what is written in our guide. Hi, yes thank you. I have my answer which follows (not accurately) the template. Would you mind to take a look? I'm new to a Analytical Writing, but this piece is really helpful.